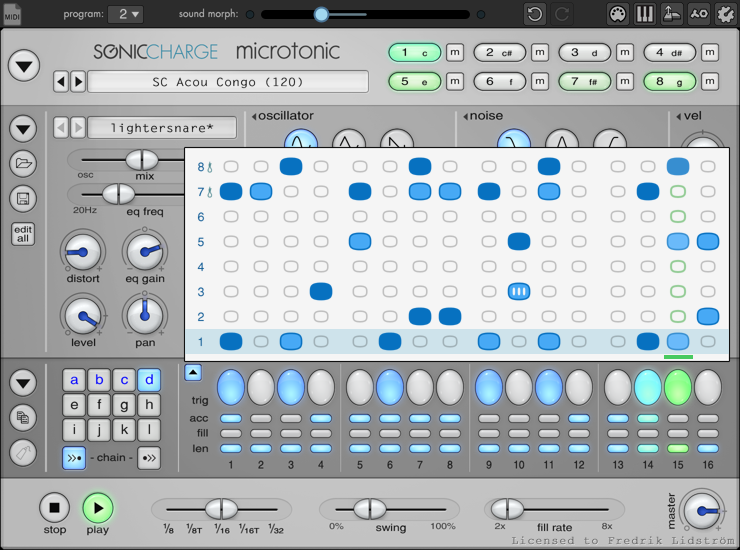 You can use Microtonic as a sound module to play drum sounds from your MIDI keyboard or sequencer, or you can use the built-in pattern engine to play drum patterns in sync with your sequencer. 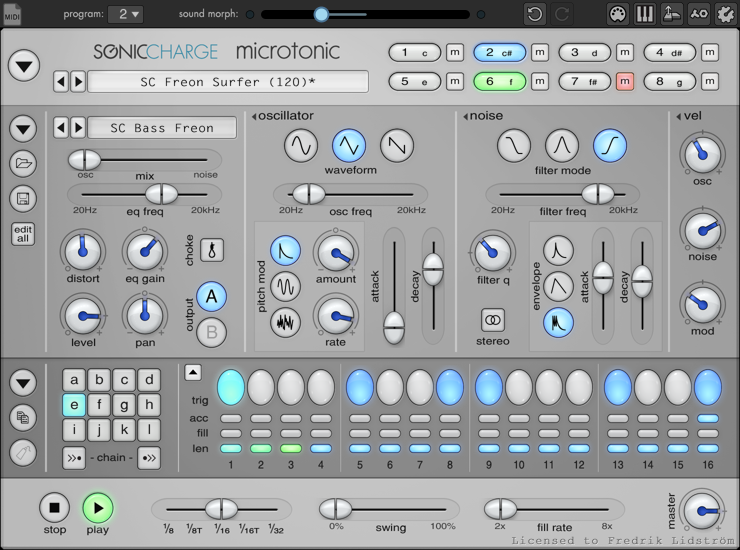 The sound of Microtonic is 100% synthetic and rendered in real-time. No samples or pre-rendered waveforms are used. Eight channel drum and percussion synthesizer. 100% synthetic sound, rendered in real-time. No samples! Over-sampled oscillators and sample-accurate triggering. Extremely low CPU utilization, less than 5% on any low-end system. Pattern based drum-machine engine, synced to the host. Easy to use interface with context menus, popup hints etc. Plenty of creative editing options like morphing, smart alteration and randomization. Comes bundled with loads of factory sounds and patterns. There are thousands of computer generated Microtonic presets available for royalty free use in Microtonic Patternarium. You can listen to them directly online, download or copy any preset directly into your Microtonic. You can also participate in the rhythm evolution by voting on what you do and do not like. For evaluation purposes you are allowed to try Microtonic for up to three weeks. The trial begins the first time you open Microtonic in your host sequencer. Microtonic then only subtracts a week from the trial time if you actually used it that week. Purchasing Microtonic allows you to use it fully and gives you free support and service upgrades. Registration keys are personal and are delivered by e-mail to the buyer after the order has been placed.